"Contact centers: choosing between cloud and premise"
Competing in today's highly competitive environment requires enterprises to have an agile technology infrastructure to support customer service and to achieve the greater corporate objective of improving the customer experience. 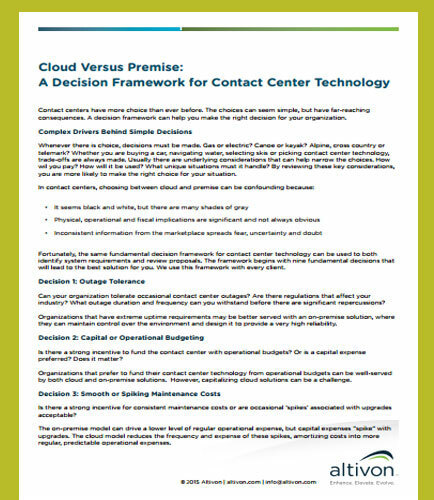 In contact centers, choosing between cloud and premise can be confounding. We advocate a decision framework and the same fundamental decision framework for contact center technology can be used to both identify system requirements and review proposals. Can your organization tolerate occasional contact center outages? Is there a strong incentive to fund the contact center with operational budgets? Is there a strong incentive for consistent maintenance costs or are occasional ‘spikes’ associated with upgrades acceptable? Does your contact center see significant variability in load? Is optimizing contact center staffing levels a key challenge?